During the Norman invasion of Ireland, Maurice Fitzgerald, the cousin of Strongbow, the English earl of Pembroke, was captured and imprisoned on the island. After the Norman victory, Fitzgerald took possession of the island, beginning an 800-year stewardship. The Fitzgeralds first built a Norman keep with typical thick walls and narrow arrow-slit windows. In the 15th-century a tower was replaced. This structure was enlarged over the centuries with additional stone wings. In the 18th century socialite Mary Frances Fitzgerald made Waterford Castle her home. She broke off her engagement to the Duke of Wellington, hero of the Battle of Waterloo, to marry her cousin. Whenever she returned to her family home, 24 musicians entertained her as she was rowed across the river on a barge. Her son, Edward Fitzgerald, found world fame as the translator of the Rubaiyat of Omar Khayyam. Several generations later, another Mary Fitzgerald married Italian Prince Caracciolo. They sold the island and castle in 1958, thereby ending eight centuries of Fitzgerald ownership. You can always tell how well a hotel runs when you meet dedicated staff who have worked there for years. 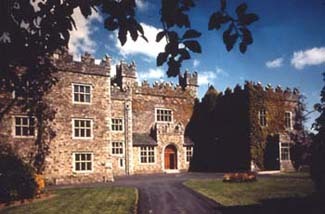 I like this castle because many of Waterford’s personnel have great-grandparents who worked for the Fitzgerald family. If you can splurge the euros, go for the one of the suites. They’re definitely the star rooms. Here and there, the hotel can probably use a little updating, but its beautiful surroundings, friendly service, and elegant ambience more than compensate. The Island is east of Waterford City off R683. Follow signposts to the river, where the castle’s own ferry transports guests and their cars across the river. Nearby: horseback riding; fishing; seaside resorts; harbor and river cruises; Waterford Crystal Factor. Receptions. Exclusive use of castle. Mullioned windows, gargoyles, turrets, towers, and battlements embellish this castle built entirely of stone. Antiques filling the grand public rooms include an Aubusson tapestry, a settee and chairs with carved eagles and swan heads, and George III and Victorian mahogany and oak cabinets. Portland stone walls rise to meet ornate plaster ceilings; burgundy-colored, Irish-crafted carpets cover the floors; and a large stone fireplace welcomes you on cold evenings. Antique-filled guest rooms range from standard size to deluxe and have views of the river, woodlands, or landscaped grounds. A carved four-poster bed dominates the enormous Presidential Suite. Many bathrooms retain their original 150-year-old tile and feature free standing bathtubs. All have lovely floral-design sinks. Considered one of the finest rooms of its kind in Ireland, the Munster Dining Room features Elizabethan oak paneling, a carved oak mantelpiece, and an ornate plaster ceiling. Entrées are served on Wedgwood dinnerware bearing the Fitzgerald crest. Stemware is, of course, Waterford crystal. All produce served is grown organically on the estate.